We're coming up on the end of my kindergartner's second to last off-track break of the school year. After her next break, she will be in first grade and we will begin our second year of year round school. If you aren't familiar, year round school operates on a track system, each track alternating being in school for nine weeks or so, before a two to three week break. For some districts, it makes the most sense given the resources and number of children residing in school boundaries. Initially, I wasn't thrilled with the idea. I worried my daughter would get into a routine, only to be thrown off and have to start again. While I believe that kindergartners have far too much expected of them academically, I did question how the frequent breaks would disrupt any momentum she gained in the classroom. Of course, there are other options: homeschool, private school, charter school. For us, public school was the right choice at the time, and we went with it. 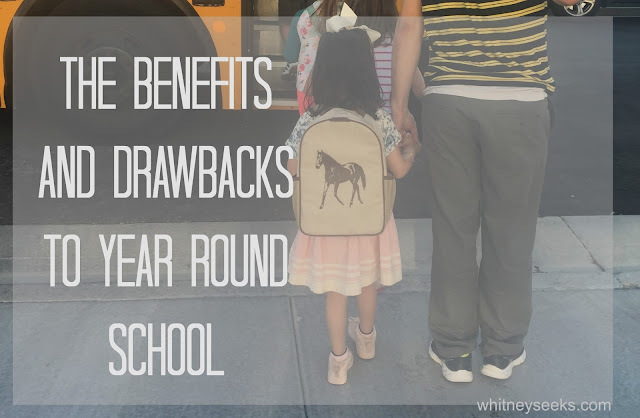 Nearly a year later, I can't say I'm converted to singing the praises of year round school over traditional, but I have picked up a bit more perspective that is proving to be helpful in making future school decisions for my children. There's breaks. The thought of having children old enough to be in school every day (and soon all day), can make me happy- happy for them to be gaining independence, experience, and yes, I am the tiniest bit happy about the idea of my sofa pillows staying on my sofa for longer than twenty minutes. I do miss them, though. My kids, not pillows. Getting a chance to spend a little extra time with them a few times a year is really great for the part of me that wants to keep my babies close. Then there's the break from needing to set an alarm and rushing through the morning to make it to school on time-- heaven. It can be nice to know that there is a break coming up, when you're otherwise headed toward an inevitable burnout. Occasionally, off track breaks line up with winter and spring break, giving you an extra long stretch of time off. You can vacation at off-peak times. Tourist heavy attractions are typically not so busy when many tracks have longer breaks. Airfare and travel accommodations are often cheaper then, too. Restarting routines is hard. Particularly when it takes a lot of courage and preparation to get to the point they're comfortable going to school in the first place. It can seem like you spend the last half the break mentally prepping to go back to school, and that's because you actually did. For children with anxiety, special needs, or any child that thrives on routine, the on and off schedule of year round school is a challenge fraught with frustration and struggle. Momentum is lost. It's widely known, and even expected, that children in traditional school will lose a bit of what they learned during a school year over their summer break. It isn't uncommon for them to be sent home with packets of worksheets and reading lists, nor is it uncommon for the first part of a new school year to be a review of previously learned curriculum. When young children are out of the classroom for weeks at a time, away from the structured learning environment and methods specific to their teacher, they aren't going to retain everything. Despite working on things at home, it's discouraging to see them struggle with concepts that they might otherwise catch on to easier, were they in the classroom consistently. This might not be a concern for all children, but it is an issue for those children working extra hard to keep moving forward. My preschooler receives speech services through the school district (currently at a traditional school). She might require them, and other services, when she starts kindergarten. Losing weeks of progress would affect her in very real, devastating ways, and is a huge factor in whether or not we would need to change districts. Childcare and children in other schools can be a challenge. For parents who need to arrange childcare, constant breaks can be a challenge. Local rec centers offer camps and programs, but they aren't always all day, and they aren't free. In many areas, only elementary schools are year round. Junior high and high schools are on a traditional schedule, leaving families with children in different grades to work around multiple schedules for vacations and appointments.